As the temperature continues to fall Sulu has to think creatively if he and the rest of the landing party are going to make it through the night. His solution – heat a rocky outcrop using a Phaser blast, allowing the landing party to take cover under thermal blankets near the glowing rocks and survive until the transporter is fixed. This highly detailed rock has been designed to enable you to replicate the experience on Earth in the comfort (and relative warmth) of your own living quarters. To recreate Survival, the rock may be made to glow redder and redder by firing the Type-1 Phaser supplied directly at it. However, unlike the rocks on Alfa 177, this specially cast replica rock has a range of more Atmospheric settings when less inclement conditions demand somewhat more soothing environmental illumination. The Rock’s illumination and function can be controlled remotely by the special First Season, original design Type-1 Phaser, a replica of the phaser used by Sulu on Alfa 177. The Phaser is powered by two AAA alkaline (LR03) batteries. Insert batteries before first use. 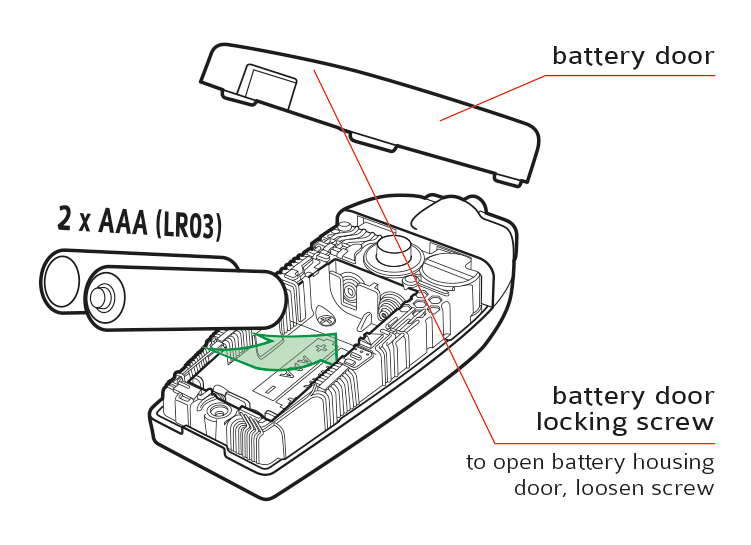 To fit Phaser batteries, first open battery door by loosening the locking screw and tilting the battery door up from the back. The door will lift off, but the screw is retained in the housing by a small washer. Note:IMPORTANT BATTERY INFORMATION: Always use only ALKALINE batteries. Ensure that they are inserted correctly. Remove batteries if the Phaser or the Rock are not going to be used for extended periods. To avoid battery leakage and damage, NEVER mix new and old batteries. Do not use rechargeable batteries. Always remove exhausted batteries and recycle. The Rock may be powered either by four AA alkaline (LR06) batteries or from a 5V USB power supply using the cable provided. 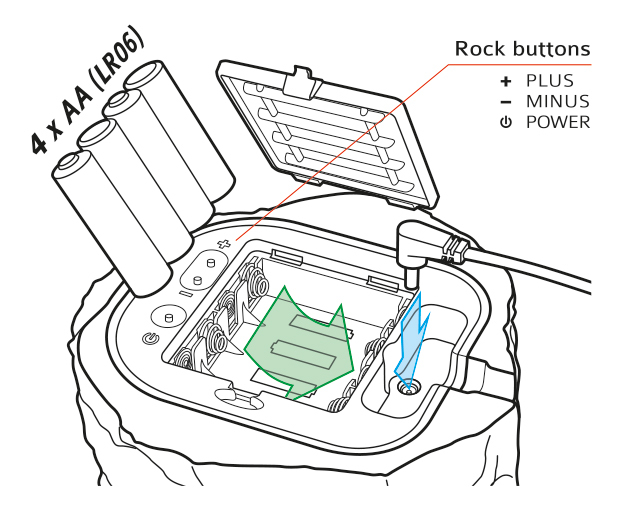 Before first use, make sure that the Rock either has its batteries inserted correctly or is connected to a 5V USB power supply. After the Rock is turned off for a couple of days whilst powered by batteries, to save power, the rock’s remote control receiver circuit will enter a special very low-power hibernation mode. To re-enable the remote control functions, press and hold the Phaser trigger button (or the plus button) for a few seconds until the Rock lights up. At times, there is nothing like a glowing rock to lift your spirits and help you survive. Double pressing the Phaser PLUS button activates Survival. To Survive, press and hold the trigger button while pointing the Phaser at the Rock. The Phaser firing sound will be heard and the Rock will glow red brighter and brighter, as if the Rock is heating up, while you hold the trigger button, until maximum brightness is reached. Note: The rock is not heating up; the red glow caused by the Phaser firing is only a simulation of the Rock heating up. When the trigger button is released the Rock’s glow will start to dim, simulating the Rock cooling down. While the Rock is glowing red, pressing the Phaser PLUS button will increase the Rock’s brightness and cancel the dimming; pressing the Phaser MINUS button will decrease the Rock’s brightness and cancel the dimming. For Survival, the Rock can only be controlled by the Phaser. The Phaser can comfortably control the Rock from distances of up to three metres (although in some conditions this can be up to ten metres or more). Note: The remote control range may be affected by bright lights, sunlight, the angle of the rock and the state of the rock illumination, all of which may reduce the remote control range. If affected please move nearer the rock to control it. On any planet, even Earth, occasionally the environment can lack a little atmosphere. Double pressing the Phaser MINUS button provides extra atmosphere just when you need it. The Rock provides atmosphere by gently glowing in any one of a wide range of colours at the brightness of your choice. 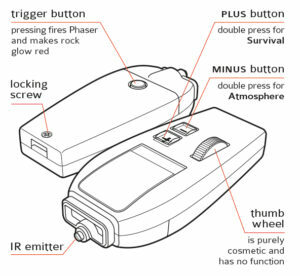 While the Rock is providing atmosphere it may be controlled by the Phaser or by using the buttons on the underside of the Rock, which have matching functions. The Phaser trigger button has the same function as the Rock power button and the Phaser and Rock’s PLUS and MINUS buttons have the same functions. If the Phaser is used to control the Rock, the functions and button presses will be accompanied by specific sounds or function announcements. Like all rocks, this rock is completely silent, so if the Rock’s buttons are used to change the Rock’s illumination state or function, no sound will be heard. A short press of the Phaser trigger button or Rock power button powers the Rock ON if it was off, and powers it OFF if it was on. When initially powered on, the Rock illuminates in the colour it was set to when it was last used to provide atmosphere. Double pressing the Phaser trigger button or the Rock power button changes the Rock’s illumination to the next base colour. There are seven base colours: red, orange, yellow, green, blue, pink, and warm white. Triple pressing the Phaser trigger button or the Rock power button causes the Rock to auto-cycle through the colour spectrum very slowly, imperceptibly fading from colour to colour. Be patient, the fade cycle takes about 10 minutes to provide the maximum atmospheric effect. Quadruple pressing the Phaser trigger button or the Rock power button causes the Rock to auto-cycle through the colour spectrum more rapidly, in about one minute. Pressing and holding (long press) the Phaser trigger button or the Rock power button causes the Rock to cycle through the colour spectrum manually for as long as you hold the button. Release the button at the desired hue. While the Rock is providing atmosphere the PLUS and MINUS buttons increase or decrease brightness. Triple pressing the PLUS button activates an instant daylight function and the rock glows with a warm white light at maximum brightness. Triple pressing the MINUS button activates a nightfall function where the rock very slowly dims to off over a period of about 10 minutes; perfect for calmly dropping off to sleep at the end of a busy day exploring a planet’s surface. The average adult human body radiates between 50 and 100 Watts of heat. Generally, much of this heat is lost to the environment. When the air temperature drops and there is the risk of hypothermia, reflecting some of this heat back to the body using a metallised survival blanket can be the difference between life and death. 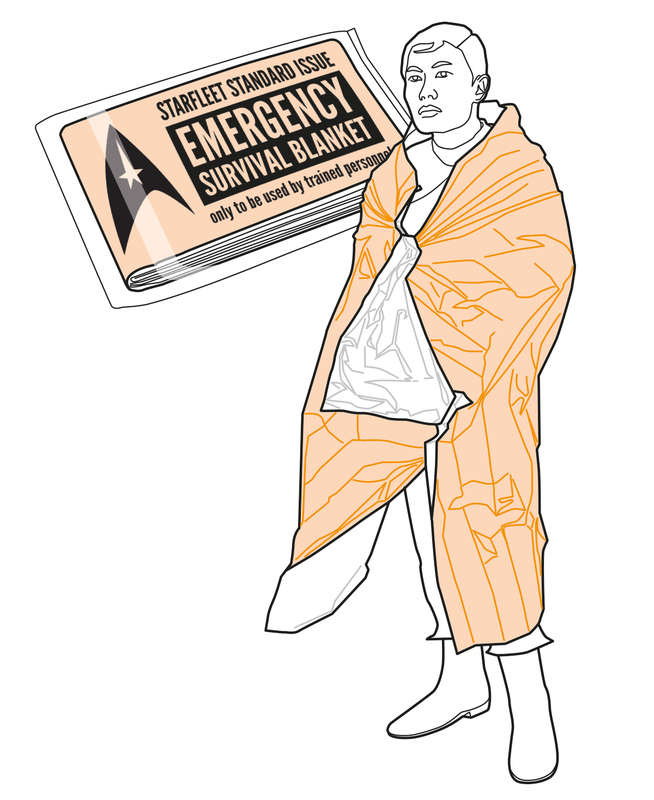 The Standard Issue Starfleet Survival Blanket provided with this product can be used to maintain body heat in freezing conditions, and for this reason could be kept in your landing kit for emergencies. To use, unfold the blanket and wrap body in it with the blanket’s silver side facing inwards. Please note that this is a single use blanket. Note: Carrying a survival blanket in freezing conditions is not a substitute for wearing the correct attire or for taking other proper safety precautions regarding shelter and transport. This Rock and the Phaser have been designed for domestic use indoors, and are not intended to be used outdoors, in gardens or in other wet environments. Do not immerse the Rock or Phaser in water. Dust the Rock or clean the Phaser when necessary only with a damp cloth. Only use the power cable supplied. Display and use Rock only on a level surface away from small children. This product is not a toy, it is a prop replica and should be handled with care.